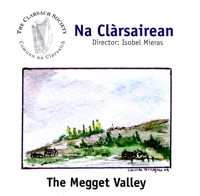 The Megget Valley was commissioned by the Clarsach Society’s Edinburgh Branch to commemorate a special birthday for Isobel Mieras, who has dedicated a lifetime of service to the Society and its individual players as a performer, teacher, composer, arranger and adjudicator, in addition to being Musical Adviser to the annual Edinburgh International Harp Festival. Isobel’s name has become synonymous with clarsach playing and voice accompaniment within and beyond Scotland’s shores, helping to bring this the oldest of Scotland’s traditional musical instruments to 21st century audiences around the world. 7. Will ye no’ come back again? 2. The Megget Valley lies in the now beautiful and peaceful Scottish Border country. In 1529 however it was the scene of great violence when King James V, in his efforts to restore law and order among the many unruly cattle thieves or rievers, sent spies to watch the house of Perys Cockburn of Henderland. During the night, the king’s men attacked, burned down his house, hanged Perys and killed the entire household - only his wife Marjory escaped. Hundreds of years later in 1983 the peace was again shattered, this time by the excavation of the valley floor and construction of a dam to create a reservoir supplying water to the City of Edinburgh. All who lived there had their homes rebuilt on higher ground - only a few ruins were left under the water. This story is told in the music, starting with a gentle Introduction and Pastorale followed by an improvised passage depicting the King’s spy and the subsequent attack. The Border Widow’s Lament tells how brokenhearted Marjory carried her husband’s body away, dug his grave and buried him. The Pastorale tune returns only to be followed by more improvised music as the bulldozers and diggers build the Megget Dam. Under the Water begins with gentle memories of life in the drowned valley, eventually moving into a jig before the Pastorale returns and peace is restore to the valley. Standing Stones was inspired by the impressive prehistoric stone circles, the Ring of Brodgar and the Standing Stones of Stenness - and the television programme in which Billy Connolly danced naked among the stones! The piece starts with a solo harp playing great chords, gradually giving way to a single bass line which develops into a jig Iike dance as all the harps join in before the great chords return finally fading into silence. St Magnus was killed on the island of Egilsay in 1115 and buried there in unconsecrated ground. Later, at his mother’s request, permission was given for his remains to be removed and re-interred in Birsay. Finally when St Magnus Cathedral in Kirkwall, begun in 1137, was ready for consecration, the saint found his final resting place. The piece is in the style of a processional, imagining the carrying of Magnus from one resting place to another with due ceremony--and with the fine Orkney rain falling. Harps at Hamnavoe pictures the small but busy port of Stromness which has been visited in turn by Vikings, whalers, explorers and tourists. It was written after visiting Mark Shiner’s harp workshop in Stromness. 5. The Isle of May in the Firth of Forth is completely silent during the winter months. In Spring thousand of seabirds return to breed and, by June, the cries of terns, kittiwakes, razorbills, puffins and others fill the air night and day. 6. The Falls of Lora is the name given to the tidal race which can often be seen at the mouth of Loch Etive underneath Connel Bridge near Oban. 7. Will ye no’ come back again? The words of this Jacobite song were written by Lady Nairne. The tune is traditional. Janette Bain, Rita Bradd, Hazel Briton, Jenny Brockie, Main Brown, Meg Carroll, Katie Davidson, Catherine Dowell, Ellie Evans, Helen Forster, Stephanie Harrison, Holly Hart, Sandra Hollingdale, Anne Kelly, Annette Lambourne, Simon MacDonald, Cameron MacDonald, Calum Macleod, Sean Macpherson, Kiyoko Macpherson, Catriona Melville, Rena Mitchell,Amy Moar, Katrina Mowat, Jane Palfery, Helen Quigley, Jennifer Rehfisch, Mary Scott, Anne Spiers, Nancy Stewart, Jean Stock, Sheona Ure. Reader: Gilean McDougall, Flute: Clare Errington, Cello: Lucy Borthwick. Christine Macleod, Anne Moar and Neil Warden.